CINCINNATI -- As part of a project called CincyFlags , residents of Cincinnati’s 52 different neighborhoods are designing flags that show off their unique geography. 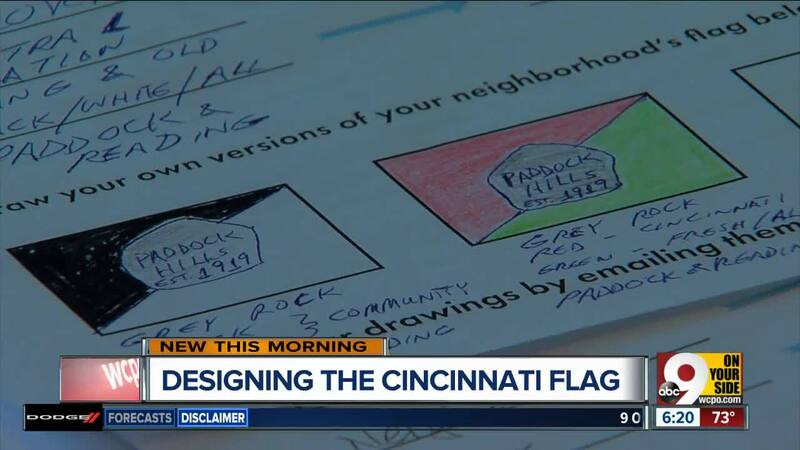 “What we really want is when people fly these flags or when they’ve created these flags they’ve invested not only in their neighborhood but also their own thoughts into what they want it to represent,” CincyFlags design director Chris Cliff-Perbix said. Henry Frondorf, the creator of Cincinnati’s Neighborhood Games, came up with the idea, but it’s up to the designers of the flags to make it a reality. “Now we’re in phase two where we’re really trying to get designs together,” Cliff-Perbix said. All of the flags will be rectangular and follow the guidelines of the North American Vexillological Association. Vexillology is the study of flags. Neighborhood flag designs will be limited to two or three basic colors. No words, but plenty of symbolism that represents each neighborhood. Neighborhoods will choose from three final designs. The hope is to fly all the flags together by late 2019. There’s still time to participate in the design process. There will be a workshop Tuesday night at the Mt. Washington recreation center.